I’ve lived in Soho for about four years now (damn, has time flown by) but only recently tried EN Japanese Brasserie for the first time, even though I’m at Lelabar across the street probably more often than I am home. Friends who have been going for years kept recommending it and we finally found a time to go together for dinner. Everything about the meal – the beautiful space; friendly service and delicious yet not-too-heavy Japanese fare – was superb and I can’t wait to go again. 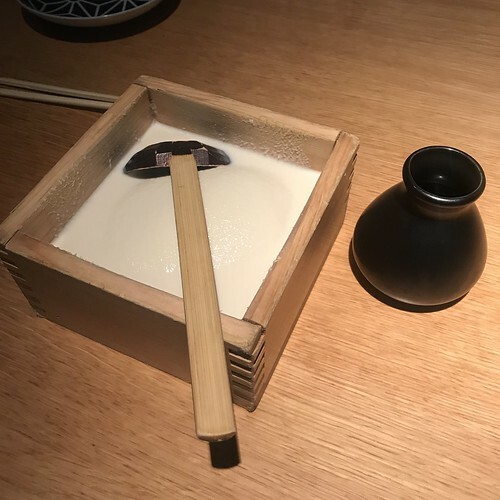 The famous house made soft tofu with wari-joyu, a light soy sauce. I’ve never had tofu this fresh in the U.S. and it was so damn good. Slightly warm and full of toasty soybean flavor with the texture of a creamy ricotta. The wari-joyu adds just the right amount of seasoning. 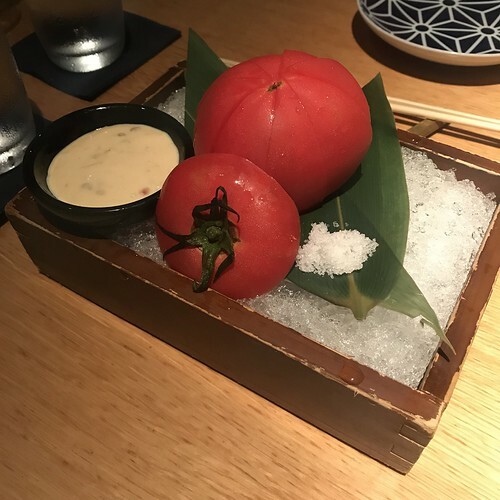 Below is the momotaro tomato with homemade miso mayo. This gift from the kitchen is apparently a fancy tomato grown in California? I dunno…it was very good and pretty as tomatoes go but…again, it was literally a tomato cut into wedges with a dipping sauce (that was very good because duh…mayo) with some needed sea salt on the side. I wouldn’t actually pay for this particular dish, especially when there are still great tomatoes to be had at the greenmarket. O-banzai, small Kyoto style dishes, to start the meal. 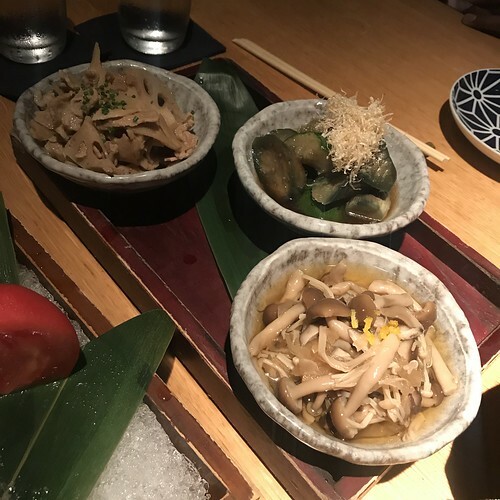 We got the fried eggplant and zucchini with katsuobushi; the shoyu-braised pork belly sliced and served with lotus root and the assorted Japanese mushrooms with sun-dried daikon in yuzu. Although they were all delicious, the pork belly and lotus root was the best. You can get 3 of the o-banzai items for $16 instead of $6 each and next time, as Paul and Gakii suggested, I’d probably do 2 servings of the pork belly, it was that good. Sweet fatty pork with the nice crunch from earthy lotus root, it reminded me of one of my mom’s braises that she used to make for us at home. 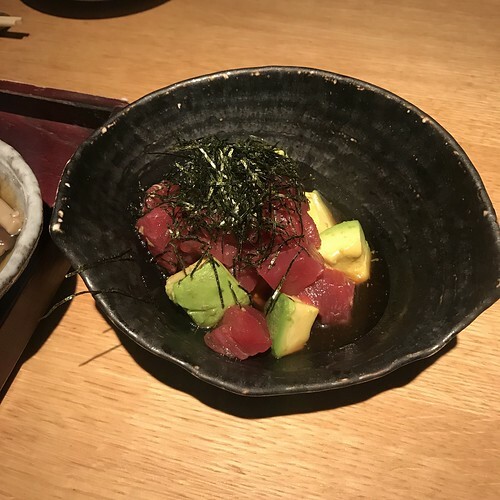 We also got the Big Eye tuna salad with avocado and wasabi dressing that, while not life-changing, was very good and nicely seasoned as tuna and avocado salads go. We ordered additional small dishes for our main course and these were definitely the highlight of the evening. 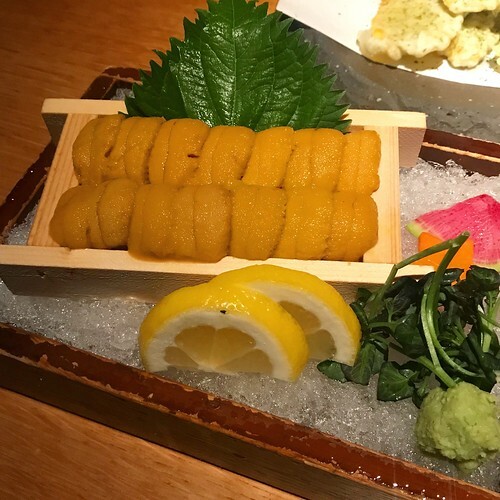 From the get-go, our server asked if we were fans of uni and mentioned that they’d just gotten a very small delivery of really prized uni from a specific area in Hokkaido (sorry, I don’t remember the name. I heard “uni” and was like, “yes, please”). We asked how she suggested we’d eat it and she said the kitchen recommended just eating it straight with a spoon to make sure we got pure uni flavor. It came out in the tray, as you see below, looking beautifully orange and super plump and we just went at it. Super sweet, slightly briny and the loveliest buttery texture, I was in heaven. Will be remembering that for a long time, which is crazy because it’s literally raw uni presented without any manipulation. 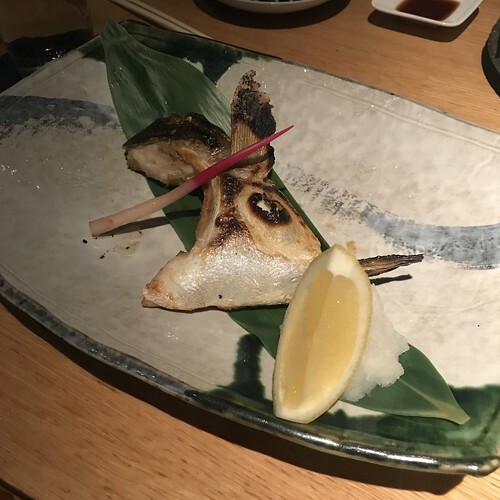 We also ordered the grilled salmon and yellowtail collars (pictured below), both further examples of how simplicity is usually the better way to go when the raw materials are high enough quality. I preferred the yellowtail, which was a bit more tender and was surprised by how much meat you could actually cull from each of those portions. 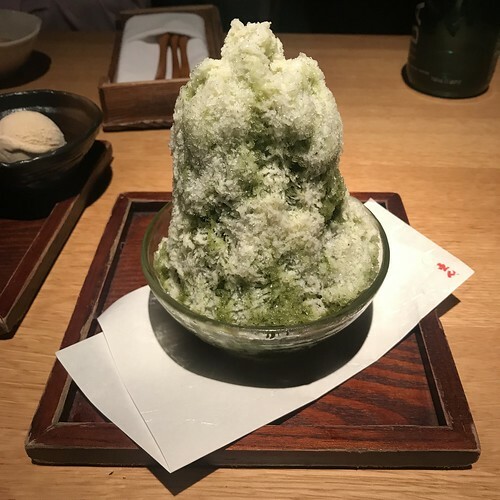 For our dessert, we ordered some really delicious black sesame and earl grey ice creams but the indisputable show-stopper was this giant mountain of green tea shaved ice with red bean hidden at the bottom. Doesn’t it look like one of those Chinese calligraphy paintings? Not too sweet and super refreshing, it was a great cap on a relatively light and satisfying meal. I couldn’t believe it’d taken me this long to finally visit EN but I’m excited to go back soon. And of course, we ended up going across the street to Lelabar for some more wine afterwards. You are currently reading EN Japanese Brasserie at Notes on Food.